Gerard is an expert in software development practices and methodologies who is experienced in transforming companies to benefit from an Open Source support and service business model. He has developed and overseen projects and is considered by his peers as a real full-stack engineer. With a focus on delivering quality and secure solutions, he has been able to provide small to enterprise level customers solutions that met their needs. He is a multi-disciplinary with excellent technical skills in a wide-range of principles; from software delivery, Continuous Integration, Continuous Delivery, and Deployment, to testing and performance tuning. An active consultant for Linux and Open Source and as part of this, he gives talks on software development and Open Source. He has years of experience developing software for different form-factors, programming and scripting languages. Specialized in dealing with mixed environments; for the Web, mobile, desktop and servers. Working on tools to improve the workflow for development with containers, OpenShift, and Kubernetes. Gerard has been integral to UnitedStack's transformation to provide services, which have led to UnitedStack becoming a Gold Member supporting the OpenStack Foundation and recognized training partner. Gerard has been able to deliver solutions to the customer based on different use-cases, utilizing Infrastructure-as-a-Service and Platform-as-a-Service such as OpenStack-based and Kubernetes. By working closely with upstream projects, he has introduced improvements that have led to a better product deliverance and overall improved quality. Gerard delivered an Internet-of-Things platform using FirefoxOS (Android) and techniques used in Platform-as-a-Service. Using an intuitive real-time HTML5 web interface, the device can be configured and provisioned with additional functionality. International Assignment Services. A suite of applications that helps a user to provide necessary information to help with tax filings in different countries and territories for One of the Big Four. Gerard worked as the technical lead at a Joint-Venture between FCHK and Nomovok. He was responsible for the development of an online contest platform focusing on people and their passions and interests. The software design and infrastructure allowed him to deliver a scalable web platform which could handle thousands of concurrent requests. During that time the also represented Nomovok in Asia and developed several successful demonstration applications using the SteelRat Linux platform for phone and desktop use. As the Technical Support Lead for the newly formed MeeGo team, Gerard assisted testers with automating test actions, retrieving tracing and debugging information. To streamline the work of engineers he co-developed a QA tool to track bugs created locally and externally. This tool consisted of a real-time component augmenting Bugzilla's interface with our needed QA components without alteration of the externally deployed Bugzilla codebase. Presented with an employee award for outstanding performance. Gerard has been integral in implementing Agile practices and dealing with intercultural issues. Gerard worked as an experienced all-round software engineer on several projects and provided training about development methodologies and project management. For the IT infrastructure, Gerard has implemented a fault tolerant setup All existing server have been migrated to a completely virtualized environment with redundant storage setup. This setup allowed Sogyo to utilize faster automated testing, a more flexible choice in technology and new ideas on software deliverance. This all led to an overall quality improvement. Command & Control Support Centre, Ministerie van Defensie (RNLA) (Ede) – Network Centric Warfare. Gerard developed a fault tolerant and secure data distribution framework used by all applications to support armed forces during missions and operations. For the Cyrus project, he implemented an interactive geodesic visualization that aids the military in planning and staging of troops and equipment. For the Very Optimized Soldier System, he ported the codebase to run as an embedded version of Windows and Linux using Mono and SQLite. He assisted several teams in the migration of TFS to Git which has helped the team to deliver faster test deliverables and overall improved productivity. Gerard led the team of a new development stream which involved bridging .NET and SoftPLC technology. Using domain driven design and a forward-looking vision, the team is now able to deliver better products using a very maintainable code-base. Gerard delivered a fault-tolerant order entry system for use during sales sessions while coping with peak season. He introduced code testing and continuous integration which became the basis for all future development. Gerard developed both front-end and back-end of an online recruiting assessment and report system which is used by various Dutch and international companies. Gerard developed the registration module and pluggable authentication code for the UEFA registration management system. Resilience (de Bilt) Gerard developed interactive front-end code for a profile registration system. As a J2EE software engineer, Gerard led the re-engineering project of an application that controls the flow of information and acts as a portal for Tax for all companies in the Netherlands. Gerard successfully developed a Business Process Management using Microsoft .NET and Microsoft Office technologies based on a prototype. It allowed consultants to visualize the project they worked on and see the immediate impact of changes. This visualization made providing feedback to the client easier and increased positive result. Gerard co-founded and led the software development team at Spotlight Media. I designed and developed a content management system using Python which was used by all customers. This system made it possible for customers to alter their content without the involvement of a content editor or developer for publication on their website, and export for use as marketing material. Gerard developed an online tax reporting system for several municipalities of the Netherlands; Apeldoorn, Lelystad, Zoetermeer and others. His contributions made it possible to re-use different data formats and database implementations as the StufTax data source for the reporting. For SILK he created a successful web front-end integration with a desktop environment to risk assessment. Because Gerard was able to provide a very broad scope of knowledge, from Windows NT, Novell Netware, to Unix and more, he often accompanied fields engineers on consultancy. Gerard performed a major rewrite on the codebase and optimized code for execution. Successfully co-ordinated and improved activities within the Fedora Community in Asia during his term. 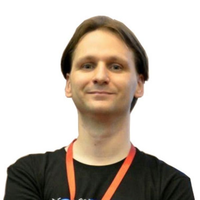 Gerard continues to be a mentor for the APAC region and the Chinese Fedora Community (Fedora 中文用户组). Project Blokken – Created an Open Source educational application based using C++ and Qt, and led the Java rewrite. Computer graphics – created an interactive 3D environment using Python as embedded scripting language, which received a perfect mark. Real-time embedded systems – created an introductory teaching program for ARM assembly. Telematics – Created a transition roadmap and case study for IPv4 to IPv6 for the school's infrastructure. Education focussed on electronics and computer interfacing.